The Magician: Ability to dream enormous dreams. Mysterious powers of perception, awe-inspiring intuition, and cleverness. Example. Willy Wonka and the Chocolate Factory. The magician is just one of the 12 brand archetype families. Each family has a fundamental archetype that encompasses the qualities of the entire family. Every family has a dominant archetypal theme, but function in both a family role and its own unique story. Although the word “archetype” may be new to you, you identify with archetypes every time you watch a movie, listen to a song, or read a book. But what exactly is an archetype and why is it important? Keep reading below to learn and discover how we use archetypes to build better brands. Simply put, archetypes are the characters of our lives. Archetypes align brands, tell stories, make emotional connections and lead us on journeys that we all can relate to. Archetypes remain consistent over time because they represent values, traits, and motivations that are essential to human nature. The root of archetypes began in the field of psychology. Psychiatrist Carl Jung advanced the concept into what is known as the “collective unconscious”. He explained this as a set of memories and ideas that are shared among all of humanity, regardless of the culture that we were born into or the time period in which you live. Jung described these shared concepts as archetypes. These archetypes spread through the collective unconscious and emerge as themes and characters in our dreams and surface in our culture in myths, books, films, and more. Jung noted that within the collective unconscious there exist a number of archetypes which we can all recognize. Each family is categorized by similar qualities, yet each contains subtle unique characteristics to make them distinct. For example, the explorer, adventurer, and seeker are in one family, whereas the caregiver, guardian, and healer, are in another. Every archetype has specific strengths and challenges that define it. For example, the explorer is motivated by a powerful craving for new experiences and will do anything to avoid boredom, even if it means not knowing what might be coming next. The brand Patagonia is a good example of the explorer. On the other hand, the one-word description for the caregiver is altruism. The caregiver is motivated to serve and provide reassurance, advice, a listening ear, and an open heart to support the welfare of others. Dove’s brand is a great representation of the caregiver. Discovering your brand archetype can be critical to your company’s success and growth. Archetypes are used to strengthen and guide your brand’s story. It is used as a tool to accompany research, strategy, and deliverables to achieve more powerful and successful results. Archetypes reveal how a brand shows up in the world, how it is motivated, and what triggers it. To understand how archetypes can help achieve your business goals, we’ll use the 4 C’s. Connection: Determining your brand archetype allows you to build connections, both internally and externally. An archetypal approach to branding will help humanize the process of being in business in general, and branding in particular, by enabling greater humanity within all stakeholder relationships. On top of connections internally, you’re able to build deeper external connections with your target audience. Archetypes can be used as a proxy for the motivations of your target audience. Basically, archetypes can help your brand understand why it attracts certain customers. This has huge benefits for brands: Instant emotional impact and visual representation of an archetype occurring in the mind of the viewer creates an instant connection. Customers: Your brand's archetype affects your customers in many ways. First, it enhances trust with them by aiding in the creation of a consistent brand story and value journey. This allows your customers to easily develop emotional understandings of your brand. Archetypes also strike into your customer's desires. You can use your archetype to specifically tailor to your customer’s wants and needs. This helps your customer see why your brand is the best solution to their problem. Consistency: Using your archetype creates consistency throughout every aspect of your business. In terms of marketing, your archetype allows you to focus your campaigns and initiatives, creating consistent messaging and designs across multiple platforms. Internally, archetypes provide a reference point for those within the organization. This gets everyone throughout the company on the same page and can even assist in uncovering previously unidentified roadblocks the company is facing. Your archetype is the most valuable when integrated across the full spectrum of your business, from the C-Suite to HR and every department in between. Culture: Archetypes can also enhance your brand culture. Applying your archetype to internal communications, process, and events will integrate your brand into your culture to create greater confidence, trust, and meaning with your organization. This then aligns with your brand's values and mission. Always ask yourself “Would the [insert your brand archetype] do or say this?” Answering this question can help you determine if that initiative aligns with your company’s value and mission. At UNANIMOUS, we offer an archetype creative exercise that will help you explore your brand identity and discover your brand archetype. 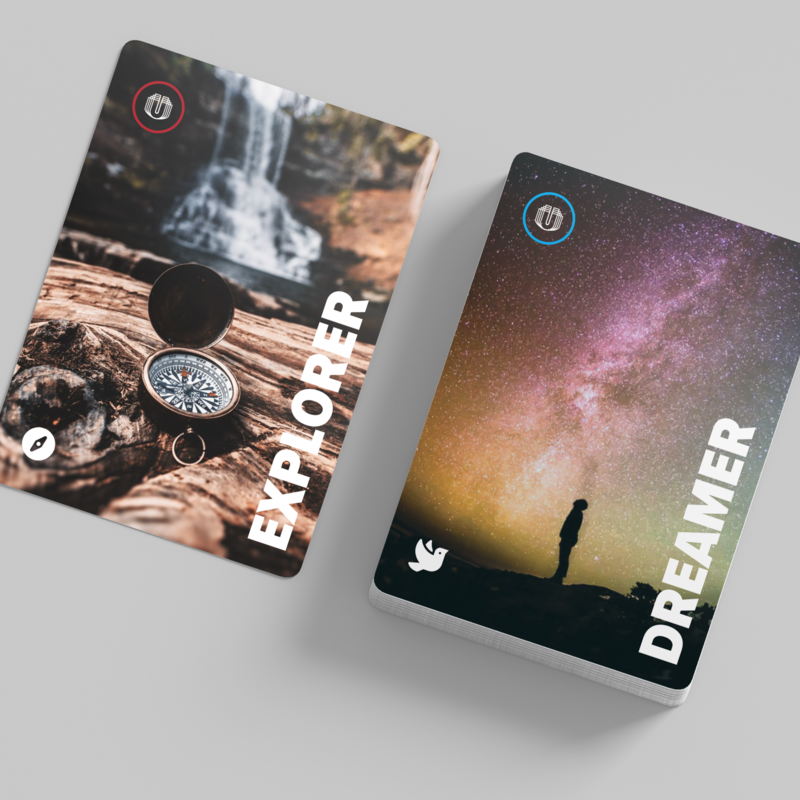 Through a series of phases using our archetype cards, we start out introducing all archetypes from a bird's eye view. Together, we go through a questionnaire and elimination process, allowing you to explore what archetypes relate to your brand. The process is one full of discovery, where the conversation around each archetype reveals meaningful insights into your brand’s personality, voice, and how your brand connects with your customer’s primary motivators and emotions. At the end of the session, we narrow down to your top three archetypes, leaving you with sound direction yet flexibility to drive the personality of your brand. Now imagine that your brand is narrowed down to a consistent persona, one that is weaved into various pieces of history, culture, and marketing that taps into the emotions of your customers. Your archetype is empowering the choices your customers make and giving them a deeper bond to your brand. So now that you understand what archetypes are and the importance, who are you? If you are looking to hone in on your brand’s personality and create consistency throughout your marketing efforts, let the experts at UNANIMOUS help. Contact Trent at Trent@BeUNANIMOUS.com to discover your brand archetype to help achieve your businesses’ goals. UNANIMOUS is a Lincoln, Nebraska based agency that assists clients with branding, marketing, and web design. With over 350 active clients across 15 states, the agency is known for its collaborative style and prides itself on rhyme, reason, and results.